There are thousands of reviews of this novel littered all over the internet absolutely trashing Sebold for her efforts. They say they were so disappointed that she could write such crap after the ground-breaker that was The Lovely Bones. They wanted The Lovely Bones II! They were devastated they couldn't love Helen Knightly the way they loved poor, victimised Susie Salmon! My dear friends; that was the point. I loved this novel. It took me some time to understand where Sebold was going with it, and what she was exploring. Once I was on board, I was absolutely overwhelmed by her skill. The novel opens with Helen confessing to killing her mother. We are then taken through the motions of how this happened, and how events unfold subsequent to the killing. That's the bare bones, and what the slandering reviewers can't get over. "It was just so boring!" they cry, "with such disturbing subject matter, how could Sebold go so wrong?" You, petal, just didn't get it. The killing became almost irrelevant as Helen's post-killing journey unfolds. As she struggles through the next twenty-four hours, we are graced with memories of her childhood, her family, and where things went wrong. These memories are the true meat of the tale, and with a bit of foreshadowing trickery, we are still putting the pieces of heartbreak together until the very end. We see the cogs of Helen's existence, and how they turn. We not only see inside her heart, but see what made it into such a cold room. This is the true mastery of The Almost Moon. Even the explanation of the book's title is absolutely gorgeous. Helen's mother, suffering from mental illnesses, is neither here or there, floating through life irrelevantly; almost something, but not quite anything. Yet she remains, like the moon, a constant force in Helen's life, relentless until the end. 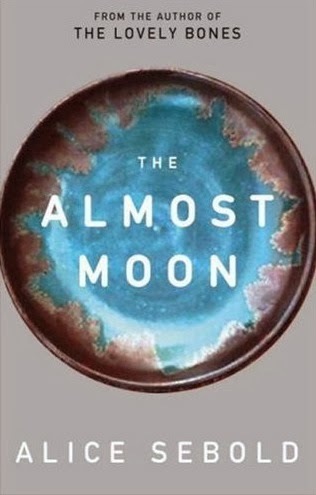 The Almost Moon - a gorgeous nickname for such an enigma. I was, and still am, really impressed by it. I do agree with one thing - Helen was abhorrent and I couldn't get on her side at all. But this just reinforced the things I learned about her, and helped me understand why other people in her life feel the way they do about her, why certain relationships broke down, and why she devoted her life to submission. Where many feel they always should love the protagonist, I occasionally love to hate them, and in doing so learn from them. Saying much more on this would spoil experiencing the slow trickle of information this novel gives, so I'll stop here. Sebold deserves far more credit than she has been given. It's absolutely not The Lovely Bones II, but why would you want that? Why should Sebold write that? This is a novel you should appreciate outside of the lines; it's not a crime novel, but a story of upbringing, poor choices, and how our minds work in times of desperation.